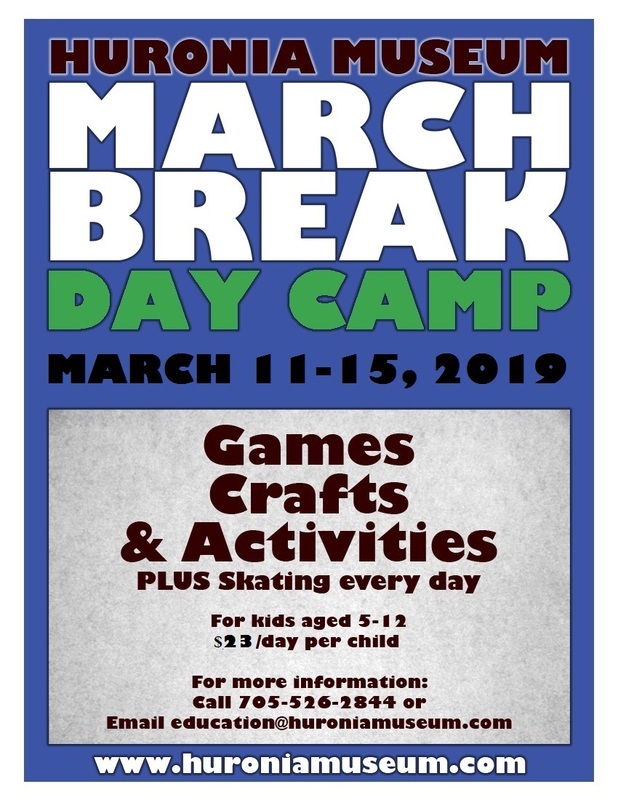 Huronia Museum is once again holding our March Break Day Camp from March 11 to March 15, 2019. This camp is for children 5 to 12 years of age. ALL CHILDREN MUST BE 5 YEARS OLD AT THE TIME THEY ATTEND CAMP. Each day of camp will be filled with games, crafts and outdoor play. We will also be skating at the North Simcoe Sports and Recreation Centre each day. All equipment required for skating must be provided by the parents. Camp hours are from 9AM to 5PM each day, with pick up any time after 4PM. All Huronia Museum Day Camps end no later than 5 PM. We will allow a 5 minute grace period but as of 5:05 PM we will begin charging $1 for each minute the child remains at the museum. The time will be determined by the camp counsellor present at pick-up. The payment should be made at the time of pick-up, and a receipt will be available the next time the child attends camp. If there are any questions about this policy, please feel free to contact the museum any time. Please remember, we cannot hold unpaid spots for campers. Registration is not complete until payment has been made. Payment must be made at the time of registration. No registration is complete until payment has been received. This means that without payment we cannot hold a spot for your camper. Full refunds will be given for cancellations made at least 24 hours in advance. 50% refunds will be given for cancellations made prior to 9:15 on the day of attendance. No refund will be given if notice of absence is not received. In the case of outstanding payments for more than 3 days, an invoice will be issued and sent to parents. If your child is unable to attend a day that has been paid for payment may be transferred to another day, but only prior to that day being missed if proper notice is received. We ask you to please read the following carefully to ensure that everyone has a safe and fun-filled time with us! Due to the large number of allergies, and to ensure the safety of all campers, all Huronia Museum camps are peanut free! So please do no pack peanut products, as they will not be able to eat them at camp. Because we are often using materials such as paint or food colouring as well as being involved in lots of physical activities, we ask that your children dress in comfortable, play friendly clothing and shoes. We will also be spending lots of time outside, so please dress in weather-appropriate clothing. We also recommend putting your child’s name in any clothing they bring, as they may get mixed up throughout the day. On field trip days please make sure to have your child to camp no later than 9:15 as some trips leave early. If you have any other questions or concerns please feel free to contact us at 705-526-2844 or education@huroniamuseum.com. I was just looking for information for summer camps. Also wondering if you are doing a PD day camp on June 3rd? Yes! We will be offering a P.A. Day Camp on June 3. It will run between 9 AM and 5 PM. The cost is $20 per child. Our main Day Camp page has been updated with more information about PA Day Camp and includes an updated registration form. Hope to see you on June 3! Summer Jam Day Camp runs from June 29 to September 2, 2011. It runs from 9:00 AM to 4:00 PM. Early drop-off and pick-up are available. The cost for Summer Jam is $22/day for Huronia Museum members, $24/day for non-members. What are the ages for summer camp 2017. Do you have more details about the activities, cost and such? Did you get an answer to this? It’s $22/day. Super hero theme. Every afternoon we go skating next door at the arena. There are a variety of games,crafts and activities. The ages are 5-12, no exceptions. Feel free to call the museum if you have any further questions. Summer Jam Day Camp runs from June 29 to September 2, 2011. It runs from 9:00 AM to 4:00 PM. Early drop-off and pick-up are available. The cost for Summer Jam Day Camp is $22/day for Huronia Museum members, $24/day for non-members. Do you have more information on the types of activities that take place during the camp (eg. themes)? Your registration form doesn’t have a spot to put in the dates we are signing our children up for, it would also be beneficial to know what activities take place and when…so we have a better idea of what days to sign our kids of up for. Thank you. Hello, Just wondering where I can apply to be a camp counselor? We are just putting the finishing touches on the activity calendar, but it should be up in a day or two. I have added field trips to the list of weekly themes. Some we are still waiting on official confirmation, but I have indicated which ones those are. Any calendar ready yet, so I can choose the days my son will attend? Thanks. Do u have to pay for the whole week or just days you want your child to attend.. Be cause I noticed some days are full? The listings you are seeing are in the 2014 version of Summer Camp. Our 2015 Summer camp information will be posted as soon as it is finalized! Yes you can choose days, you don’t have to send kids for entire weeks, or you can do so if you choose to. Just looking or information about October 2015 PA day camp? If you are running one this year. Unfortunately we have a programming conflict and will be unable to have a PA Day Camp on the 23rd. We will be having them throughout the year as we are able. I will post information on our website and our facebook page as these camps are coming up, but always feel free to check in with me directly.